I recently purchased a Popsicle tray in an attempt to create some delicious, healthy treats for less than I would spend at the grocery store for juice and sugar Popsicles. 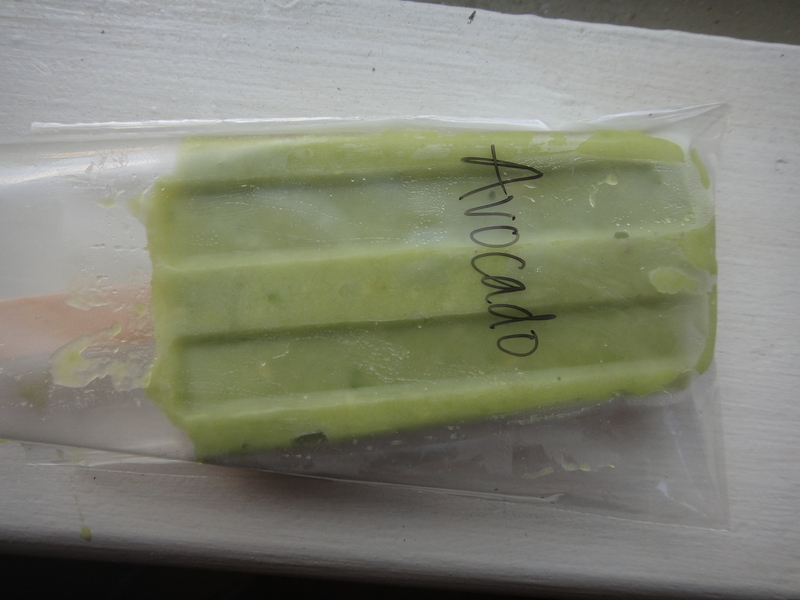 So far, so good…I’ve made Roasted Banana Ice Pops (which I have in the queue for later this week) and today’s Avocado Ice Pops. I know they sound weird and the color is a bit unappealing to some, but I promise these and really good! If you like avocados at all, I think you’re going to love these! They’re sweet, creamy, and surprisingly refreshing on a hot summer day and since there’s no dairy in them, they’re also pretty light (both in flavor and calories). Looking for an interesting cookbook for making ice pops and other frozen treats this summer? May I suggest Paletas: Authentic Recipes for Mexican Ice Pops, Shaved Ice, and Aguas Frescas by Fany Gerson? This recipe as well as the Roasted Banana Ice Pops I’ll be sharing came from this book (that I bought at the same time as my tray). My mouth is watering thinking about the other great recipes in here I can’t wait to try, like Spicy Pineapple Ice Pops. Combine the water and sugar in a small saucepan and cook over medium-high heat, stirring, until the mixture comes to a boil and the sugar has dissolved. Let cool to room temperature. Cut the avocados in half lengthwise. Remove the pit and scoop the flesh into a blender, along with the cooled syrup and salt. Blend until smooth, scraping the sides as needed. Add the lime juice and blend just until combined. If using conventional molds, divide the mixture among the molds, snap on the lid, and freeze until solid, about 5 hours. If using glasses or unconventional molds, freeze until the pops are beginning to set (1.5 to 2 hours), then insert the sticks and freeze until solid, 4 to 5 hours. If using an instant ice pop maker, follow the manufacturer’s instructions. I’m not entirely sold, but I keep seeing avocado in sweet recipes so I’ll keep an open mind. My problem with avocados is when I buy them I just have to make guac and well there go the avocados! Have a great fourth.